When San Francisco Officer Montgomery Singleton goes to work in the morning, he hoists himself onto his bike and rides peacefully down Third Street. As he pedals, he passes business storefronts he’s always known, little cafes and family-owned restaurants where he’s always spent his lunch breaks. For blocks and blocks, Bayview locals stream in and out of businesses. Many others hang out at intersections in packs of friends and family, boisterously laughing and bumping music on their stereos. And in all of this, Singleton blends in. He stands tall, with broad, imposing shoulders, a badge on his chest and a military-style haircut, a sight likely to intimidate — but he glides on his bike, parks it right across the street from Mendell Plaza at Third Street and Palou Avenue, and spends most of his time as an officer just talking with people like they’re family. 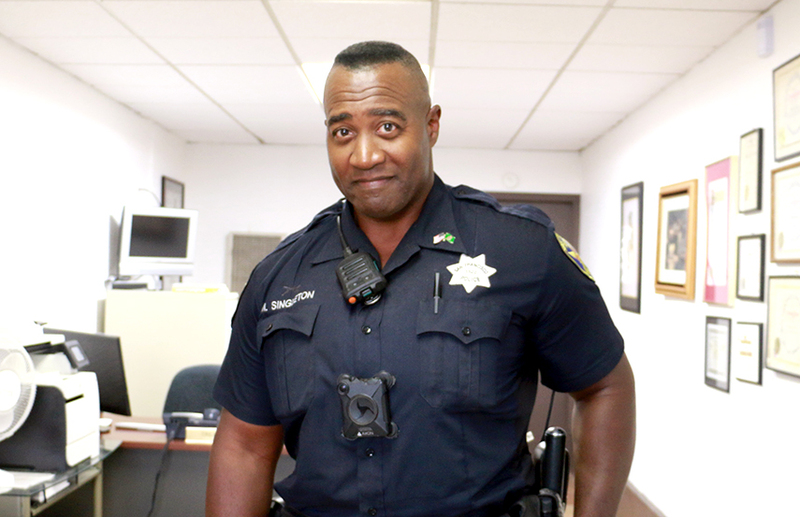 “I grew up here,” said Singleton, the Bayview station’s beat cop for nearly 23 years. He chose the Bayview assignment because he saw a need in the neighborhood that was largely abandoned, impoverished and unprioritized by the city. Singleton always gets the ribs when he takes his lunch at Marvin Jeffrey’s Let’s Eat BBQ & More. Douglas Jenkins can always expect Singleton to stop in the little shop he’s owned for decades to swap some war stories. Dwayne Robinson, owner of the Bayview Barber College, said Singleton is always around — he was the first officer to respond when Robinson’s brother was stabbed around these blocks a few years ago. Though Singleton has always been doing community policing, the department has only recently renewed its emphasis on day-to-day operations, encouraging officers to get out of their patrol cars and walk their beats. Across the street from Mendell Plaza, Singleton leans on his bike and keeps an eye on a particular crowd of people, many of whom are homeless, abuse drugs and alcohol in broad daylight, and occasionally commit quality-of-life crimes. They represent a small fraction of the predominantly black community in the Bayview district, one that is nevertheless grappling with enduring poverty and unequal opportunity. This is a reality Singleton understands, being a black man born and raised in these neighborhoods. It’s a reality that informs the way Singleton does his job. He’s not quick to make arrests, often because he knows who these people are and understands their struggles. Bayview has withstood waves of gentrification, an entrenched community history and recent incidents of gun violence, most notably the officer-involved shooting of Mario Woods several blocks down from where Singleton walks his beat. It’s where “people just don’t have a lot of hope,” Jackson said. It’s a mission in Singleton’s life that is simple and doable: treat people the way you want to be treated. But it’s a mission with minimal risk, compared to the experiences he had for years serving in the military and the tour he did in Iraq from 2004 to 2006. In a National Guard combat infantry unit, Singleton carried his whole life in two bags and worked alongside people who weren’t going to come home. One day in Iraq, while traveling along a road in a Humvee, Singleton and his team were expecting the worst. Suddenly, a local sprang out of their home and dashed up to the trail, stopping the team from continuing on their path. “This person had seen us before and runs out to tell us that others had buried something in the road ahead,” he said. It was an explosive device. The warning was an act of kindness Singleton would never forget. Other teams that saw more casualties were ones that treated locals less than fairly, Singleton recalled. It gave him a clearer picture; that how you treat people comes back to you. “And it gave me perspective,” said Singleton, who had already been working as a police officer for eight years before he decided to follow his father’s path and enlist in the military. For most of the ten years he served, he continued walking his beat in the Bayview, except for one weekend a month, when he participates in drill exercises. In Iraq, Singleton had a mission and endured the challenges of conflict and geography to execute his goals. Now, in San Francisco, his mission is to rebuild the trust that has eroded between communities and the police. In recent years, the challenge has been the powerful Police Officers Association. Last year, he withdrew his membership from the POA, an act of protest in response to the union’s lasting relationship with its former head, Gary Delagnes, despite his reference to SFPD sergeants as “snitches” for reporting misconduct. The union also publicly condemned 49ers quarterback Colin Kaepernick for taking a knee during the National Anthem — something Singleton said was entirely out of the union’s scope and misunderstood the very essence of freedom, something he fights to protect. The two incidents are part of a longer history of the union failing to include minority officers in its leadership, and a culture of inequality that puts officers of color at a disadvantage. Since then, three black officers have been promoted to Captain, but Singleton himself has passed on a few offers. Daniels said it was “commendable that he continues to be here,” that he continues to put Bayview first. Singleton hopes to show something different to a community whose horizons have been limited, borne of poverty and disenfranchisement. “Just by my existence here, being the beat cop and the only black cop that’s up and down the street for years now, I open up some options available for them,” Singleton said. Daniels said that for the community, there’s something transformative about seeing a black cop who always circles around the neighborhood on his bike. Kids will latch onto that visualization and internalize it, she explained. To Jackson, who once served as OFJ president, Singleton carries both empathy and sympathy in a neighborhood that doesn’t always get equal justice. Because of that, the community is learning to trust again. Really….really…case by case..that is true. Some drugs dealers can deal right in front of him….some people he has a lack of respect for…N then he is a single man with connections to a whole lot of ex’s in the neiborhood..n the one’s who dress to distract him n call him. Boo..He gets free food n his eyes on the ladies….